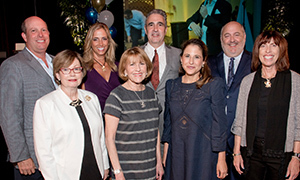 As Jewish Federation of South Palm Beach County President & CEO Matthew C. Levin announced, together they have raised nearly $74 million in 574 legacy commitments from 433 donors over the past two years for their own and the entire Jewish community’s future. "Every one of those commitments came from people who understand the importance of ensuring our future now," remarked Levin. "Thank you for leading our Jewish organizations to a place of firmer footing so they may continue to positively impact Jewish life now and for future generations." Administered by the Federation’s Jacobson Jewish Community Foundation (JJCF), the local CJL is part of the Harold Grinspoon Foundation's LIFE & LEGACYTM initiative. “For the third year in a row, according to the Grinspoon Foundation, our community continues to have the most successful LIFE & LEGACY program in the country, in terms of dollars committed,” Levin added. "So many families here can now say that they are committed to making a difference in the lives of our Jewish people now and in the future, to ensure that our Federation, synagogues, agencies and schools continue to thrive," said Anne Jacobson in her welcome. Immediate Past Chair of the Federation Board, Jacobson co-chairs the CJL with her husband Norman, Elyssa Kupferberg and Mark Schaum. The night’s guest speaker, Rabbi Sherre Hirsch, offered a talk and introspective exercises based on her book, Thresholds: How to Thrive Through Life’s Transitions to Live Fearlessly and Regret-Free. Greenspoon Marder is the generous sponsor of the Jacobson Jewish Community Foundation. Southern Glazer’s Wine and Spirits was the event’s In-Kind Sponsor and Boca Magazine was Exclusive Media Sponsor. For more information about CJL, or for a confidential conversation about legacy giving, please contact Lottie Nilsen, Foundation Director of Development, at 561.852.3109 or lottien@bocafed.org.